Please check later for upcoming shows. Jo regularly exhibits in group shows at The Victorian Artists Society Galleries. Current works can be viewed on Instagram joreitzeartist. Sandi Pullman, Bachelor Applied Science Hon. (Burnley) currently studying Masters of Research (Deakin University) Head Gardener La Trobe Cottage will officially open the show. Megan Backhouse wrote ‘The canvas is always greener’ for Saturday Age Gardening. It was published on 17 March during my exhibition. This article on my garden’s inspiration for my painting was also presented as ‘Hemmed in by subdivision, artist plants a creative haven’ – Sydney Morning Herald. This can be read on line. This prestigious award is awarded to the artist receiving the most votes from exhibitors throughout the year, including in this exhibition. Contemporary artists, Mark Dober, Kathy Fahey, Philip Davey and Jo Reitze have been invited to exhibit along side significant works of the Australian Impressionists, including Frederick McCubbin, Arthur Streeton and Tom Roberts, their teacher Louis Buvelot and following generations such as E. Philip Fox. I am delighted to be featured on this highly regarded series and thank Graeme Stevenson and Sophia Stacey for making this possible. 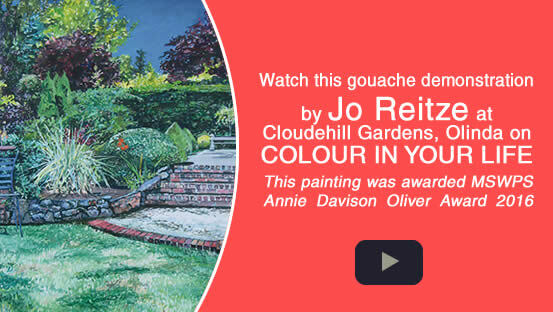 Whereas most artists are shown in their studios, I chose to be filmed painting in the magnificent Cloudehill Gardens where I was formerly Artist in Residence. The jazz-tinged cinematic backing is by the talented Australian pianist and composer. Paul Spurling from his August Ep. Initially screened on Sunday, 15 February on Channel 74 TV4ME Jo’s episode has since been shown throughout the world. You can click on the arrow to see it here. View www.colourinyourlife.com.au for detail on being featured and to watch other episodes. I hope you enjoy my episode and that of other artists. A series of 16 gouache paintings that capture the essence of this magnificent hillside garden, in all seasons. As Artist in Residence she completed all works on location. Corner of Station Street and Ellingworth Parade, Box Hill. It gives Reitze great pleasure to show these vibrant paintings in Cloudehill’s twentieth year. Cloudehill is a significant place in many people’s lives and this exhibition is sure to delight them as well as other garden and art lovers. Cloudehill is a glorious Olinda garden, justly regarded as Australia’s finest. It is the realization of the vision of Jeremy Francis, the owner and artistic inspiration behind Cloudehill. Jeremy has carefully selected plant colours and textures to create beautiful compositions that require no artistic licence from the painter. Man made structures such as paths, walls, sculptures and pots complement the organic shapes and patterns of foliage and flowers. This is a garden artist’s paradise. Reitze has painted numerous gardens but none of such great variety and beauty. She is proud of these paintings and is delighted that Jeremy will Officially Open this joyous exhibition. Jo will demonstrate gouache painting techniques and then give participants the opportunity to create a little plant study from direct observation, either in the garden or viewed through the windows. an exhibition featuring their large garden paintings in oils, gouache or acrylics. Follow this link to the delightful article by Denise Gadd about their work. All paintings in this exhibition are available for sale. Email jo@joreitzeartist.com.au after January 21 if you require the price list of her paintings in this show. In 2008, Marion and I met at Life Drawing sessions arranged by Melbourne Society of Women Painters and Sculptors. We soon learned that we shared a passion for gardening, painting gardens and for using gouache. This inspired us to plan a joint exhibition that soon evolved into two. Both exhibitions will feature impressions of our own gardens as well as many public and private ones. Marion resides in Hughesdale but lived in England for ten years where she studied painting at the City and Guild of London School of Art. There she was inspired by English gardens and landscapes. Marion now attempts to capture the essence of life around her, through her images of gardens, landscapes, interiors and still life. In clearly individual ways, we create joyous, expressive compositions that freely capture the essence of the scene. Marion’s paintings invite the viewer to look beyond interiors into the garden, while mine enclose you in magnificent environments. Our paintings welcome you into the garden, hence the title of our Brighton show- ‘Come into the garden.’ We both are inspired by direct observation. While my paintings are completed on location ‘en plein air’, Marion also works in her studio. l use line and colour to bring coherence to the diversity of the garden, whilst Marion attempts to explore the relationship between the exterior garden and the interior, be it a room or an individual. Marion’s beautifully designed works are characterized by her harmonious palette and broad, painterly approach. My paintings are freely executed with lyrical, almost calligraphic mark-making and vibrant colours, enhanced by strong tonal contrasts. As in nature my works are unified by a range of green hues. Marion often places figures in her compositions while my gardens are uninhabited. Mine are often viewed from a close vantage point with clearly recognizable plants and features. Marion, like the French Impressionists, often chooses to view her gardens from a high vantage point. We both paint in gouache and oils while Marion also uses acrylics. Our paintings are innovative and much more than the photographic; they celebrate the beauty of nature. Painting gardens and gardening have given us great solace. In turn we hope our joyous works will give you pleasure, be you art or garden lovers, viewers or buyers. We hope you all enjoy our diverse approaches to similar subjects and welcome you to both exhibitions. 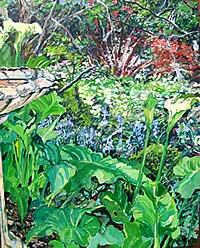 ‘Garden Glimpses’ presents an exhibition of their small gouache paintings. We invite you and your friends to the opening. We will be delighted to see you then or at other times. Beyond the garden wall was devised and mounted by Surrey Hills Neighbourhood Centre. Bringing older people, artists and the community together to promote positive attitudes to ageing, it looked at gardening in the lives of Boroondara seniors through oral histories, paintings, photography, film and diaries. Jo Reitze’s paintings record the rich tapestries created of the participants’ gardens. The text describes their philosophies and influences. Atmospheric paintings inspired by the coastal environment of Ocean Grove with images of river flats, windswept trees and Barwon River. An exhibition of joyous garden paintings and flower studies in gouache or oils including Cloudehill borders, will be opened by Christine Reid, renowned garden writer and journalist on March 27 at 5.00pm. 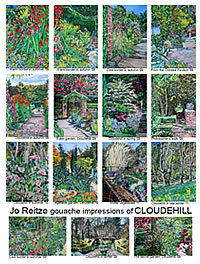 Jo will also demonstrate in gouache and will be happy to discuss her autumn paintings of Cloudehill as they unfold. An exhibition of seascapes, plant studies and garden landscapes. Jo Reitze has been delighted to be involved in a very exciting and innovative project, initiated by Surrey Hills Neighbourhood Centre. 'BEYOND THE GARDEN WALL' focuses on gardening and its significance in the lives of twenty senior residents from across Boroondara. This exhibition will feature twenty oil paintings of diverse gardens by Jo Reitze. Her paintings vividly capture the essence of these gardens, reflecting the individuality of their creators. ‘BEYOND THE GARDEN WALL’ exhibition will include all works generated from the project; bound oral histories, photographs of participants in their garden, the film of the project, personal visual journals as well as Jo’s paintings. Jane Edmanson, well known presenter of ABC Gardening Australia and 3AW will open the exhibition on November 7. The free exhibition at the Augustine Centre, 2 Minona Street, Hawthorn is open to the public on November 8, 11, 12, 13, 14, 18 - 21 from 9.30am - 4.30pm. “Beyond the Garden Wall” was funded by The Department of Planning and Community Development with sponsorship from the Bendigo Bank, The Augustine Centre and Neighbourhood Centres in Boroondara. I am delighted to invite you and your friends to view my paintings in our recently purchased adjoining property on the corner of Beech Street and Broughton Road, Surrey Hills. A special viewing with nibbles and drinks will take place throughout the day on Wednesday, December 19 from 10am – 8pm. I look forward to catching up with you on this occasion or before Christmas to show you my many new works. Paintings will be on sale, with many small works suitable for Christmas presents. Cards will also be available for sale. The paintings will include flower studies and garden paintings in a range of sizes, impressions from our travels as well as images of the bay and Wattle Park. I paint gardens on commission and will be pleased to give quotations, brochures and information about immortalizing your garden or those of your friends and family. March 10 - Rutherglen Art Show. "Prelude to Spring" gouache on paper $500. Ch'i Hair Studio and Gallery, 193 Canterbury Rd., Canterbury 3126, opposite Canterbury Gardens. 1985 ‘Rhapsody in Green’ First One Person Show at Sturt and Nolan Gallery opened by the Lord Mayor of Melbourne, Councillor Tom Lynch.